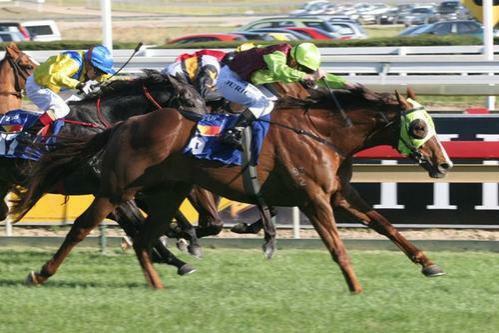 The field was strung out for much of the 1600m of the BM58 contest at Pakenham on Tuesday and our fellow Kev's Lad was one of the horses doing the chasing from a bit better than midfield. When leader Thee Jenner kicked clear into the straight the task for those behind looked a difficult one but one horse emerged and fortunately it was Kev's Lad who really knuckled down over the final stages, putting his nose out right where it counts. "I was pretty impressed with that win," reported jockey Michael Poy who was having his first ride on the progressive four-year-old, noting that "he had the weight and had to do it pretty hard." "It was a good effort by the horse after a frustrating run of abandoned meetings," Mitchell said, adding that Kev's Lad had also not been having much luck in the barrier draw. "Subsequently he had time between runs but it was his second go at the mile and he was right up to the mark and able to finish off strongly off the back of a solid tempo." "He looks like he is going to stretch out over further in time. He is still maturing; he comes from a family who have always taken a bit of time and he is no exception." A home-bred for the Kealy family, Kev's Lad is a son of Group One sprinter Bon Hoffa (pictured) and the unraced Mukaddamah mare Rousey, half-sister to the Stradbroke Handicap winner Rouslan and also dam of the eight times winner Country Tide and the three times winner Miss Godden.